These are the window terms to use, and the questions to ask, before buying glass windows for your home. U-Value (Winter Night-time) The smaller the number, the better. When a home is primarily heated, the U-Value (heat flow out of the home) is the correct rating to inquire about. Solar Heat Gain Coefficient The lower the number, the less heat is going into the house. When a home is primarily air conditioned, the SHGC value is the correct rating to inquire about. Visible Light Transmittance The higher the number, the brighter the light that is transmitted through the glass. UV Light Transmittance (TUV) The Lower the number, the better. It is the percentage of invisible, harmful ultraviolet light that passes through a window. UV Damage Weighted Transmittance (TDW) The lower the number, the better. It is the amount of solar energy that enters a window and can cause fading of interior furnishings. This includes all ultraviolet energy as well as the potentially damaging portion of visible light, and is the best representation of fading probability. 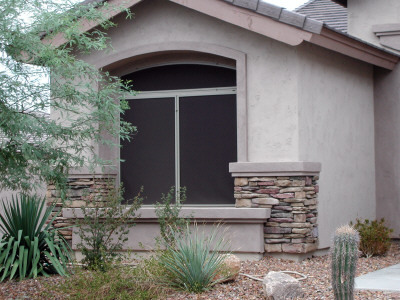 Regardless of the window quality, and the terms used to describe it, it will probably be advisable to add shade screens to the outside of your home and some type of window treatment to the inside.